I have been keeping a training log for many years. Although I have moved from keeping track using simple cyclometers on my bike, to using Polar devices to now using Garmin GPS units, I have always transferred everything over to an Excel file. That has allowed me to keep a great deal of data and compare between years. For 2010, things did not go quite as I had planned. I started the year out thinking my ultra cycilng events would be less than before, but during training for the Hoodoo 500 I ended up having some heart issues, which later turned out to be high blood pressure while exercising. So although I did not do any cycling rides longer than 112 miles and never ran more than 8 miles during the year (2007 was my last marathon), I still ended up with some pretty good statistics. Some feel the best measurement for most people is to just count total hours. It is an easy way to equate different types of exercise. When I look at hours logged, it is amazing how close 2010 was to the prior three years. Of course an hour of running seems to be more exercise than an hour on the bike, except when I am doing a lot of climbing. For cycling I track two parameters, accumulated miles ridden and accumulated feet of climbing. In both cases I was a bit less than last year and even more so for the prior years. About half of those cycling miles were with Anne. The feet of climbing continues to amaze me when I realize that during the year I climbed more than 100 vertical miles. On the other hand my running was more than last year, but still not as high as the years when I was training for a marathon. I feel that in 2010 I had a better balance between running and cycling. 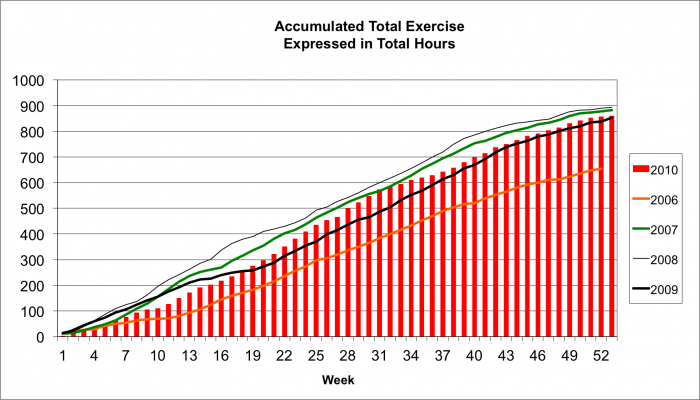 Running is a much more efficient sport time-wise. Still most of my exercise comes from cyling. Most all of my running was with Anne. She actual ran a bit more than I did for 2010 because there were a few days when I did some Ultra Distance training on the bike when she did a run instead. Only a couple of years ago I use to lay out an aggressive plan early in the year for events I wanted to complete during the year. For 2011 I do not yet have any specific plans established. As I get my blood pressure under control, I hope to return to do some more ultra distance events during 2011 and may even train for a marathon or half marathon. Even if I am not able to do that, I plan to keep my mileage up, both cycling and running, as I did in 2010.